An ENDLESS loop infinitely repeats the loop body - without a condition to enter or exit. Hence an endless loop itself does not contain any text. The text entry area in the editor is disabled therefore. You may, of course, add comments. Endless loops in a way contradict the concept of an algorithm as an effective computation description that proceeds through a finite number of steps. Yet they may be useful e.g. 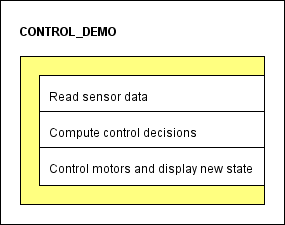 in a context of machinery control. 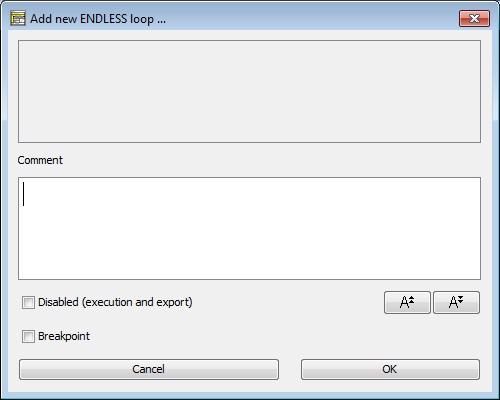 In order to make sense, an endless loop requires the loop body to be computable in finite time, of course. By means of a Jump instruction you could possibly break out of an endless loop, but if there are predicatable circumstances instigating a leave, then it will always be preferrable to use a conditional loop instead. 2. Fill in some comment if you like (the upper text field is disabled).